I love Chinese food, although I think authentic Chinese food is hard to find outside China. I spent two years of my childhood in China, and memories of foods, that we had back then, have been stuck with me ever since. It's been 30 years and some of my food memories may have been slightly changed by the accumulated amount of non-authentic Chinese food that I had in Chinese restaurants around the world. But in the end, I think I can still judge if a certain could have been served to me in China or if I have a westernized Chinese dish in front of me. I asked our Japanese neighbors if they knew a good Chinese restaurant here in Dubai. Probably not the wisest thing to do. It's a bit like asking a British person to give you recommendations for a good German restaurant. Geographical proximity of two countries is not enough to qualify someone for recommendations. I was recommended the Royal China restaurant in DIFC in Dubai. A beautifully modern place, kept in black, red and white colors and modern, straight lines. I was happy to see Chinese people eating there. A good sign. Now here is the lesson: In a Chinese restaurant, order what the Chinese eat. Nothing else. I learned it the hard way. On my two visits to the Royal China, I made the mistake of eating the westernized Chinese foods. They didn't convince. Chicken drowned in sweet chili sauce, prawns covered in sweet chili sauce, noodles coated in sweet chili. When I think of westernized Chinese food, sweet chili sauce is the first thing that comes to my mind. I had spring rolls too, which were almost good: hot and crispy on the outside, but with some un-identifiable vegetables inside, again rather on the sweet side. I ate wasabi prawns. I guess it was my first ever Chinese dish that included mayonnaise. I am sure, 30 years ago and over a period of two years, I hadn't come across a single dish that contained mayonnaise. You want to know what the Chinese ate in this restaurant? Broth-based soups. And steamed dim sums, filled with prawns or a meat herb mixture. If I go back to the Royal China, I'd order what the Chinese eat, or as a rule of thumb, anything that has green vegetables or herbs in it. They bring flavor, they stand out, they cannot be drowned in a too sweet sauce. Nevertheless, the Royal China inspired me to cook some Chinese food at home. 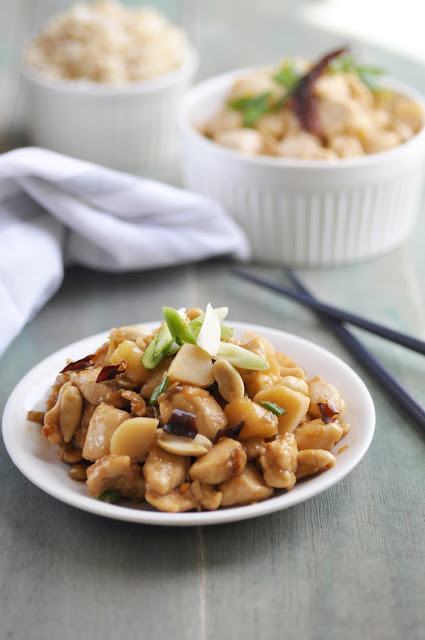 This Kung Pao chicken recipe is surely not authentic either, as a few of the main ingredients (like Szechuan peppercorns) are not easily available here in Dubai. But it makes a quick tasty dinner on a weekday night, paired with rice. Any leftovers are good shredded on a salad of raw vegetables the next day for lunch. Bon Appetit. * if you like your Kung Pao Chicken with lots of sauce, add some water to the sauce ingredients and up to 1 teaspoon cornstarch to thicken the sauce. Cut the chicken breast into small 1-inch cubes. Place in a bowl, sprinkle with the cornstarch and toss until well coated. In a wok, heat 1/2 tablespoon of the oil over medium heat. Fry the chicken for about 5 minutes, until no longer pink in the middle. Meanwhile, combine all ingredients for sauce and keep in a bowl nearby. Transfer cooked chicken pieces to a bowl, and heat the remaining oil in the pan. Add garlic, onions, ginger and chili flakes and fry for a few seconds. Now add the sauce ingredients and cook until sauce starts to thicken. Add the chicken pieces back into the pan. Stir in water chestnuts and peanuts. Cook until thoroughly heated, another minute or so. Serve hot over rice.